Tammy (Stamatina Roussianou) is born in 1948 (Athene). She is a Greek female singer from the 1960s. 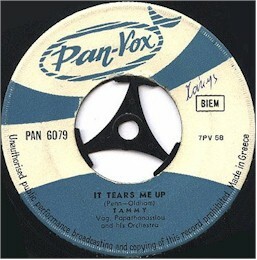 Her first single was released in 1966. In the mid-70s, after her marriage, she stopped her musical career. 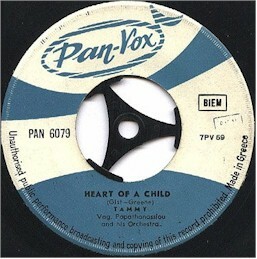 Heart of a child: Composed by Marlin Greene & Bruce Gist. Performed by Vag. Papathanassiou and his Orchestra (Vangelis) & Tammy. Special thanks to Robert Eichelsheim & Bas Dekkers. Thanks to Don Fennimore for the scan. For more information, go to the Vangeliscollector (Tammy) page.